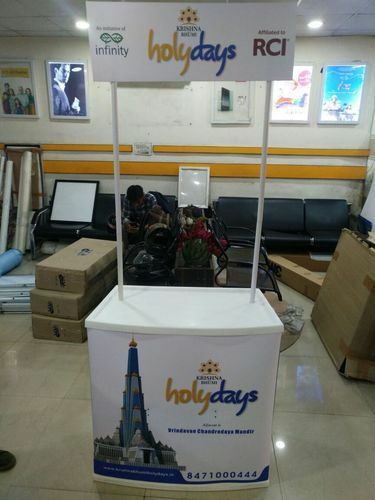 Promotional Tables - Promo Tables The Promo Table, Display Counter, Promotional Kiosk or Promo Plastic Portable Table Display, Tempered Glass Display Demo Canopy Table Tent are now a days very important tools for marketing Activities for Marketing campaigns. Marketing persons can stand easily with Demo Table to interact with clients and explain the concepts of their products or services. Promo Tables serve dual purpose of branding as well as selling over the counter. We supply high quality promo tables. Contact us for more information. Established in 2011, "Gogia Print-O-Grafix", has emerged as the undisputed leader in the industry for service provider of reliable range of Custom Made wallpapers and Printing Services. As renowned leaders, we are offering Custom Made wallpapers, Wallpapers Printing Servicesm and Custom Prints. Our highly experienced designers manufacture optimum quality products for a range of billboards, advertising hoardings and public sector wallpapers across the nation. Our products, appreciated for their fine art, elegant look, durability, low maintenance and weather resistance, are catering to demands of both Private and Public sectors. We are operating out of an ultramodern facility in the heart of New Delhi. We have maintained a high production since our production house is equipped with latest technology systems and machinery. Also, our designers and R & D personnel are working overtime to deliver customised products that are demanded by valued patrons. Besides setting up a large production facility, we have invested heavily in our packaging and warehousing unit. Our products go through rigorous quality tests before being supplied in the market.